Many of our clients focus on niche (or specialty) products useful in a variety of applications. Hardened electronic components, cables used to supply the space program, and many other DoD-type projects can be found in this area of web site design and development. We do not have many package-level samples to display. Based on higher margins niche companies enjoy, this sector of manufacturing design has relatively few examples to show. Most are corporate-level website design projects. 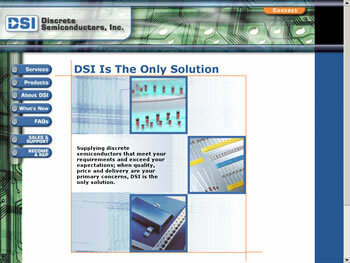 Discrete Semiconductor's web site was developed with economy in mind. Simple layout and striking photos carry this small budget web site to a higher level. The inexpensive cost of the web site allowed Discreet Semiconductor to spend money on a new logo thus adding value to the whole project.